Click the above timeline panel to view the full timeline. 1850: Californians were celebrating admission to the Union, and the school’s foundress, Mother Mary Goemaere, came from Paris to Monterey to open the first independent and first Catholic school in California, and to establish a tradition inseparably joined with this state’s history. 1854: the school moved to Benicia, then the capital of the state. During the ensuing thirty years, it became the center of culture and education for California’s young women. 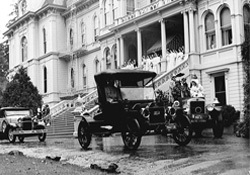 When Benicia’s importance as a population center began to decline, after the state capital moved to Sacramento, the sisters determined to move the school to a more central location in the Bay Area. 1889: the novitiate and boarding school were transferred to San Rafael. 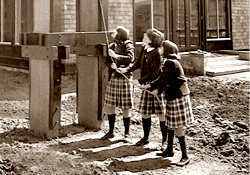 Despite extreme poverty during the first few years, the sisters kept up the high standards and traditions and enhanced the school's already distinguished reputation. 1965: the school moved to its present location in Sleepy Hollow, San Anselmo. 1973: San Domenico School begins a Pre-Kindergarten and Kindergarten program. 1985: the Alice Dupas Brown Library, serving all grade levels, is completed. 1994: our Sustainability project is inaugurated and became an important part of campus life. 2001: the School built the state-of-the-art Sister M. Maurice Powers Science and Technology Center. 2003: the Tamara A. Valley Athletic Center, featuring a 10,000 square foot gymnasium and workout room, and the Hall of the Arts, featuring a fine art gallery space, seven practice studios, and the Bettye Poetz Ferguson Hall, opened. 2004: the Carol Franc Buck Hall of the Arts was completed, including a fine art gallery space and housing our Music Conservatory and Virtuoso Program. 2005: our sustainable Garden of Hope expanded to include an outdoor kitchen and facilities for the care of poultry. 2009: 2,358 solar panels were installed on-site in partnership with Recurrent Energy—the largest solar installation in a Marin school. 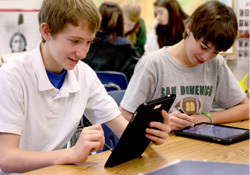 2011: San Domenico introduced a 1-to-1 iPad program in grades 6-12—the first in Marin County to do so. SD is recognized as an Apple Distinguished School in 2012. 2014: the administration and board of directors, with the approval of the Dominican sisters, commit to extending coeducation through to the high school. 2015: the first ever coed Upper School freshmen class launches with 33 boys and 44 girls. 10th, 11th, and 12th grade students welcome the trailblazers with open arms, the results exceed everyone's expectations, and lead many to ask, "Why didn't we do this sooner?" 2015 also marks the beginning of our anniversary year: San Domenico's 50th year at the San Anselmo campus, and 165 years of Dominican Spirit as California's first independent school. 2016: inaugural Freshmen Boys Basketball team finishes the season 9 - 2. 2017: the Dominican Sisters and the San Domenico Board of Trustees determine that the School will no longer be a Catholic school and will not be recognized by the Archdiocese of San Francisco as such. The School has honored, and will continue to honor, its Catholic and Dominican heritage. 2017-18: inaugural Varsity Men’s Baseball and Basketball teams both win BCL Championships. 2019: the first fully coed class will graduate from the Upper School, marking the first time in history that the School is fully enrolled, coed, K-12.